To get the right textures and tastes it is important to use the proper ingredients. Many different recipes call for salted pork. But I find that smoked ham enhances the flavor of the soup. In fact the version at Yuan Yuan restaurant is made with Chinese Jinhua ham (金華火腿). In America I recommend the use of Smithfield ham. The high brine content and smokiness of Smithfield ham resembles that of Chinese Jinhua ham. The smoked ham should have the bone still intact and cut into large pieces. 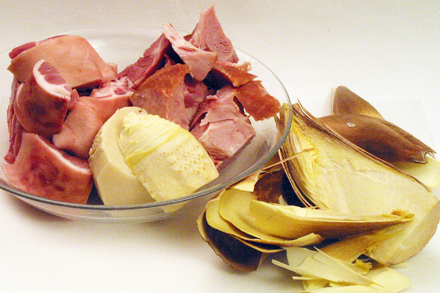 Fresh ham shank is traditionally used for the fresh pork ingredient. The skin should not be removed and the meat should also be cut into large chunks with bones still attached. Ask your butcher to saw the bones for easy cutting. 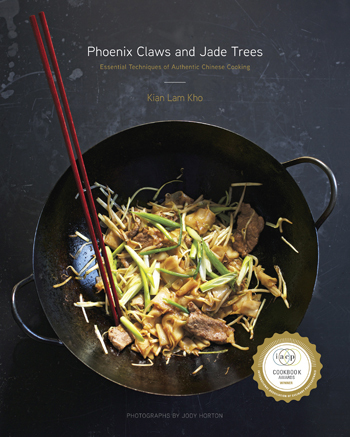 The next crucial ingredient is winter bamboo shoots. Between January and March a special variety of bamboo sends out these most sought after young tender shoots. They are specially prized for their sweet flavor and crunchy texture. The crunchiness does not diminish with long cooking making winter bamboo shoots a great ingredient to add texture to this soup. To make “Yan Du Xian” the ingredients are boiled at a very low simmer in a clay pot for hours. What results is an incredibly clean pork broth with melt-in-your-mouth meat and crunchy bamboo shoots. At the farewell dinner we were a group of expatriates from all over the world joined in friendship by our common situation. Sharing this meal I was warmed by our friendship and by the “Yan Du Xian,” which always reminded me of the long lasting bond we developed. Soak the ham in four cups of water for about three hours to dissolve some of the salt. Discard the water. Par-boil both the smoked ham and the fresh ham shank in a stockpot with five cups of water on medium heat. Skim off any scum forming on top of the liquid. Cook for about 20 minutes. Remove the meat and put in a large Chinese clay pot. Strain the liquid from par-boiling through a fine sieve and pour into the clay pot. Or you can discard the liquid and use fresh water instead. Peel off the tough outer leaves from the bamboo shoots. The simplest way to accomplish this is to cut the shoot lengthwise into halves and then remove the leaves. Par-boil the bamboo shoots in a stockpot with about four cups of water over medium heat for about 5 minutes. Drain the shoots and let cool. Slice the shoots very thinly crosswise when cool. Put the bamboo shoot slices into the clay pot. Crush the ginger root with a knife and put in the clay pot. Add white pepper and simmer the soup covered over very low heat. Cook for about three hours. Just before serving add the scallion for garnish and ladle the broth into a small bowl along with small a amount of the smoked ham, fresh ham shank and some bamboo shoot slices. I would love to go to chinatown with you one day…I was just there today and I guess I missed the bamboo…. This winter bamboo is one of my favorites! I first “discovered” it myself when I went into my favorite dumpling shop and saw them cleaning a box of some produce on the back table. Since I didn’t recognize it but knew it was superfresh I asked if I could order it. It was “winter bamboo” Deong sun? I think is how I was told, but then recently another server called it something completely different. For many of us who grew up only knowing canned rectangles of bamboo shoots (that frankly sort of tasted of the can) this fresh winter bamboo is a revelation. 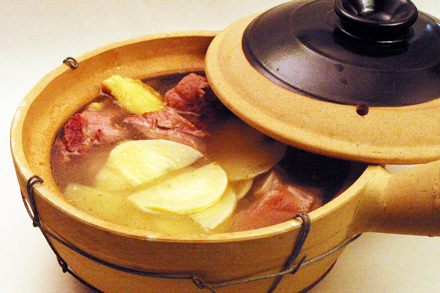 Next winter, I’ll try to remember to look for this soup – it looks delicios! Thanks for another beautiful post and recipe! Yes, winter bamboo shoot in Mandarin is pronounced “dong sun.” They are sweet and crunchy. Absolutely delicious. We’re definitely coming to Boston around Easter. Can’t wait to see you then. I can imagine the natural sweetness in this soup. Leela, Thanks for the link! I’m glad you visited Red Cook and enjoyed the posts. Your post first caught my sight with the Chinese clay pot and rice bowl which I seldom saw on the food gallery. Just like the way you describe all those ingredients and explain the meaning of Yan Du Xian. Tell you what, as soon as I spotted the availability of this winter bamboo in the market (~Nov/Dec in Hong Kong), I immediately had this dish cooked at home. But regretted that it was made before the publish of my blog and therefore the recipe is not included. Just to share, I even purposely went to a market where more items of Shanghainese ingredients could be found and bought a pile of soy bean sheets for adding into the soup (the sheets had be folded and tied as knobs before cooking). Like this? Sounds very delicious and looks great too! Terri, Welcome to Red Cook. I look forward to a great dialog between our blogs. 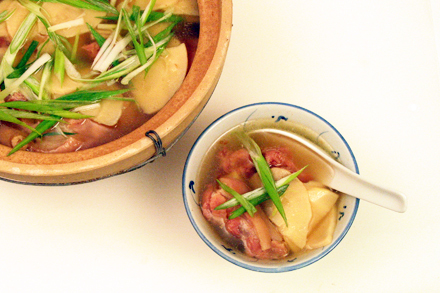 Pls tell me which Smithfield ham you prefer for this ‘Ham and Pork Shank Soup w/ Winter Bamboo. ps : enjoy your site very much. I usually like to use the uncooked ham still dry from curing and in the cloth bag. You can get a small hunk of it by going to a good charcuterie shop. Thanks for your kind words about Red Cook. Have fun cooking Chinese!